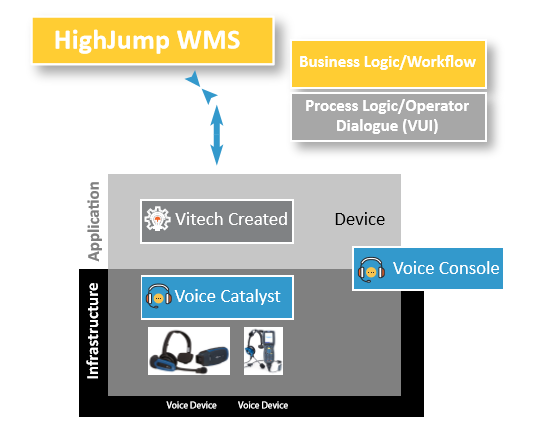 Voice technology helps HighJump WMS users extend their logistics and fulfillment processes. It offers the promise of hands-free, eyes-free, wireless access to the information needed to drive key warehouse processes and has become an important component in the success of many IT strategies. Like the traditional RF-based scanners, voice solutions center on a small, wireless mobile device. The difference is that voice delivers instructions verbally through a headset and captures responses using a microphone, eliminating the need to stop, look at a screen, and key in a quantity or scan a barcode. Coupled with a wireless headset, voice users can completely remove the need to have the mobile device on their body, offering even more freedom of mobility compared to traditional RF units. The assignment, whether it be for picking, replenishment, or another workflow, originates in your HighJump WMS. The assignment is then sent to the voice application, where it is translated from data into audible commands. The user on the warehouse floor then provides spoken responses to confirm the actions given by the commands. These responses are then turned into data, sent back through the voice application, and transmitted back into your WMS for live-time updates. Keep the proper goal in mind: The objective of any evaluation is not to figure out how to get voice into the warehouse. It is about selecting the best tool for the job. Do your homework: Operations managers do not need to become experts in the technology to consider its use. However, anyone evaluating voice needs to know enough about its usage, alternatives, benefits, components, cost structure, and integration to make an informed decision. Put together the right team: Implementing voice into your HighJump warehouse requires the a team that understands the inner workings of the HighJump platform and the voice software. As a part of HighJump, Vitech has the unique ability to work with your HighJump services team to learn the ins and outs of your operation, and bridge the gap between what you want to achieve, and exactly how you will get there. Be realistic and above board: The ability to adequately state benefits and costs is the crux to any successful evaluation of a technology or system in the warehouse. However, assumptions and estimates are an inherent component of even the most structured evaluation process. No matter how scrupulous an organization is in its process, there is always the potential of some unknown factor compromising the end results. Some operations respond to this risk by being conservative on benefits and factoring in a contingency line item on costs. Others bracket minimum, expected, and optimistic savings/gains by benefit. Regardless of the approach employed, any operation evaluating the technology needs to occasionally step back and question whether the numbers being employed are realistic. Since 2005, Vitech has helped our customers select, purchase, design, implement, administer, and upgrade their HighJump and Vocollect Voice solutions. As a Premier Vocollect Voice Total Solution Provider, and a part of HighJump, we know how important it is to get a voice system that meets your expectations. Our team is committed to seeing projects through from concept to completion, and we bring our voice expertise and best practices to every implementation. With a broad base of voice and HighJump customers around the globe, every day Vitech continues to deliver customized voice solutions that meet the needs of our customers, both today and in the future. For more information, please visit www.vitechgroup.com.